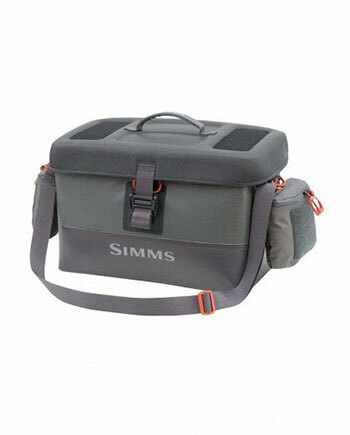 I recently stuffed a SIMMS Dry Creek Boat Bag to capacity and discovered how important it is to have a solid organizational system when speeding along in a boat. Boats are tight quarters, but gear has to be properly secured if you’re to access it quickly – which is often the case. From the top, a compression molded lid keeps water out. A magnetized, one-hand catch & release latch ensures easy and lightning quick access, or closure. Durable 420D nylon waterproof fabric, with impenetrable RF-welded seams, keeps reels, lines, leaders, tippets, tools and accessories bone dry. Apart from waterproof protection, this bag boasts a configurable, 3-compartment layout. Simply rip out the two dividers if you’re partial to a one-compartment bag (I recently discovered many people are just that), or just attach panels in unlimited configurations to keep everything from accessories or gear to food/beverages organized and secure. Additional features include exterior fly box pockets, two large removable (designed to attach to a wading belt) waterproof exterior tool docking stations, and a detachable shoulder strap that doubles as a bag leash in rough water. This extra-tough bag is built around a solid base and can take more than a few knocks and spills: your gear will be very well protected. Rounding out the package are no less than four large exterior Velcro patches and a zippered compartment in the lid for flat items like leaders or topo maps. Comes in two sizes: 27L and 41L. Highly recommended. Patagonia has improved their Micro Puff Hoody – again. 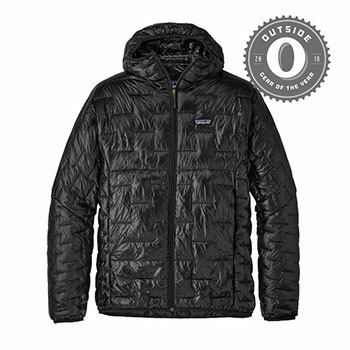 Now in its third generation, the jacket boasts the highest warmth-to-weight ratio in the apparel industry. Gen 3 sports an even more streamlined design, featuring elasticized cuffs and hem to seal in warmth, a hood that sets the standard for fit (tapers right into upper shoulders) and, of course, minimal weight. The hoody features a DWR shell with insulation that crushes down to approximately 20% original volume and bounces back into shape in seconds, making this jacket a travel essential. The PlumaFill insulation replicates the structure of down in a continuous synthetic insulation material, and a good part of that weight savings stems from innovative, minimal quilting construction that both stabilizes and improves the loft of those PlumaFill strands. One pocket doubles as a stuffsack with a reinforced carabiner clip-in loop. A go-to jacket for wind, rain and plummeting temperatures. Bonus: two internal chest pockets can house a pair of medium/large fly boxes. Highly recommended. The Sparkr Flashlight/Lighter and Pronto Battery pack provide first-rate illumination plus power to spare. Three intensity settings (100%, 50% and 15%), provide light for all occasions/emergencies. The unit smartly converts into lantern mode for hand-free operation. Throw in an electric plasma lighter (housed at the opposite end of the flashlight head), which creates an electrical arc rather than a flame to easily spark up kindling and paper even in the wind and rain, and you have an optimal and essential fishing tool. 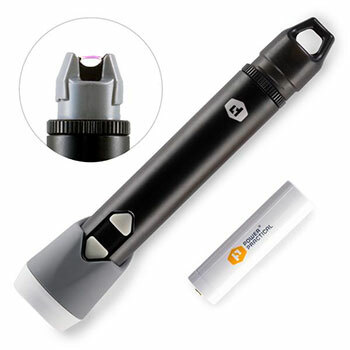 Weatherproof controls, machined metal shaft and tough polycarbonate lens means this flashlight is ready for tough duty. Pair it with the Pronto battery pack, which features a 10,000 mAh USB charger with built-in LED lantern and DUAL USB OUTPUTS 2.4A (12W) outputs to charge your phone or any other device. The Pronto BP is wrapped with LED lights that have adaptable brightness so you can dim it to that perfect amount of mood lighting that you were looking for. Only 7oz, but packs a lot of power in a tiny form that fits in your pocket or backpack. Drop the duo in your boat bag for all of your on-the-water lighting needs. Lastly, Howler Brothers’s attention to fine detail and design is evident in any one of their garments, and it’s great to see this growing company retaining a high a level of commitment to the product. Just in time for colder weather comes the Howler Brothers Stockman Chamois Shirt, an offshoot of the popular Stockman Flannel. The Stockman Chamois features a soft, hi-volume fabric that borders on thermal wear. You get warm, comfortable and Howler Brothers style all in one garment. Easily subs for a light sweater. 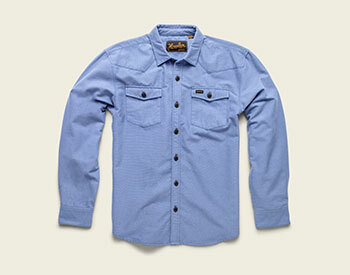 This is a versatile, boat-worthy poly-cotton chamois fabric shirt that boasts coconut buttons and an integrated sunglass-cleaning microfiber patch. Fully functional on a skiff or at the marina bar.